Ranger is back. Production of units headed for showrooms starts on Monday, seven years after the truck was discontinued for North America but continued to be sold in the rest of the world. It will arrive in showrooms in January. The old Ranger was built in the defunct Twin Cities Assembly Plant in St. Paul, Minnesota. The 2019 Ford Ranger starts life in Wayne, Michigan, at the Michigan Assembly Plant, which used to make the Focus and C-Max. It will be joined by the Ford Bronco SUV in 2020. The 2019 Ranger is based on the global pickup platform that dates back to 2011, but it is capable enough to be a best-in-class player, said Joe Hinrichs, Ford president of global operations, at an event at the plant Monday to celebrate the truck’s return to the market. The steel frame has been updated, and the North American version has its own sheetmetal and powertrain: a 2.3-liter twin-scroll turbocharged four-cylinder EcoBoost engine and 10-speed automatic transmission—no manual. The engine gets 270 hp and 310 lb-ft of torque in the Ranger. The pickup can tow 7,500 pounds and has 1,860 pounds of payload. Fuel economy numbers have not yet been certified. Still no plans to offer Ranger Raptor in U.S.
Hinrichs repeated the message that there are no plans to sell the Ranger Raptor in North America at this time but said “never say never,” which is industry-speak for reserving the right to add the tasty item to the menu in a few years when Ranger has satisfied all the pent-up demand and sales start to slip and need enticement. By then, the latest F-150 Raptor will have a few years under its belt as well and not be as threatened. There is a crew cab for the first time, as well as SuperCab. No regular cab, two-door work truck for this market. The 2019 Ranger for the U.S. has more off-road tech, including a Terrain Management Control system, Trail Control, electronic locking rear differential, an off-road tuned suspension, and an off-road info screen that can show the truck is on a 17-degree angle on the side of a berm. Trail Control debuts on the 2019 Ford Raptor, replacing Hill Descent Control with a system that both propels and brakes—essentially an off-road cruise control that works from 1-20 mph in any transfer setting. 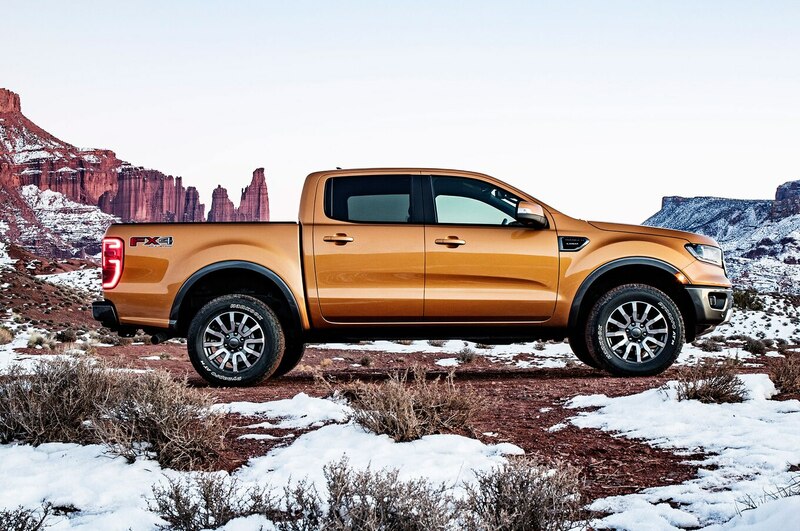 It was developed in-house, and Ranger will be the second Ford vehicle to get the system. We have not driven it yet, but from the passenger seat, the system covers an off-road course with little drama, which was the intent. Hinrichs says Ford is not late to the party and its attributes will make it a player. It beats the top-selling Toyota Tacoma in towing and payload, and it has an extra inch of ground clearance for off-roading and better breakover clearance at the center of the truck to avoid getting stuck seesaw-style. Expect a lot more accessories for the Ranger—more than 150 parts, which is the largest offering for a Ford truck to date. Ford has a partnership with Yakima for assorted roof racks and camping gear, including a tent. Customers have clamored for the return of the midsize pickup since it was discontinued. Ford in the past said its F-150 filled those needs but now says the F-150 has grown enough in size and price that there is room for the Ranger. Some would-be F-150 buyers will downsize to Ranger, Hinrichs said, mostly those who had to overbuy because Ranger was not an option until now. Ford was the dominant player in the smaller truck segment it abandoned. Since then, the Toyota Tacoma has grown to about 200,000 annual sales in the U.S. and General Motors introduced the Chevrolet Colorado and GMC Canyon which combine for about 145,000 annual sales. The segment has grown to about 500,000, Hinrichs said. That does not mean Ford expects to sell less than 100,000. There are loyal Ranger fans who have known for years the truck is coming back and have been patiently waiting. And there are always conquest sales. New entries also have the power to increase a segment’s total sales. Ranger and Bronco bring the Michigan plant back full circle yet again. The plant stated life in 1957 making station wagons and was retooled in 1964 to build the F-100 pickup truck as well as buses and other commercial trucks. The plant made the Bronco from 1966 to 1996 when the SUV was replaced on the line by the big boys: Ford Expedition and Lincoln Navigator. When the industry started to bottom out and people dumped their big SUVs for affordable and fuel-efficient small cars, Ford stopped making the Expedition and Navigator in 2009. The plant was retooled again, this time to make the Focus compact car in 2010, including hybrid and electric versions. Later it added the C-Max hybrid and plug-in hybrid. But buyers shifted their tastes again. Lower gas prices and interest rates allowed them to return to trucks and SUVs. Sedan sales have fallen enough that Ford announced plans to discontinue all cars but the Mustang for North America. Michigan Assembly was retooled again to make the Ranger on a single shift until a second shift is added in 2020 with the addition of the Bronco. Ranger and Bronco are part of a plan to replace 75 percent of Ford’s lineup by 2020, dropping the average age of the portfolio from 5.3 years now to 2.3 years in 2020. The post 2019 Ford Ranger Starts Production in Michigan appeared first on Motor Trend.